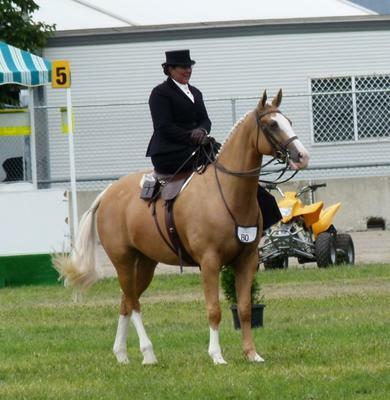 2013 Canberra Royal was our first Royal Show in Sidesaddle!!! I decided that Razz and I would have a go at the Sidesaddle Hack and the Historical Sidesaddle class. We have only been in sidesaddle for about 6 months, and we still have to work through a few issues - my sidesaddle riding for one. Canberra had turned the rain on and off for the whole show, but mostly competitors were fairly lucky dodging it.We placed 4th in the Sidesaddle Hack class, and 7th in the Historical class. The navy habit is a traditional habit - with top hat and veil (which was to stop branches and leaves brushing against your face on your ride), blouse, riding stock, vest, jacket and apron, black top boots, one spur, and a sidesaddle whip. The sidesaddle is an original Owen made in England. You can see the extra strap beside the girth - this is called a balance strap which helps to keep the sidesaddle balanced and not tipping over to the left.The girth is a leather three-fold fitzwilliam with three girth points. We do up sidesaddles on the off side, so as to not "pull"the saddle off balance to the left. In the Historical class, I chose not to canter. I was wearing a true Victorian full skirt which if something untoward happened, could wrap around the head on the saddle and drag me along. There are a number of accounts of women being dragged to their deaths by getting caught on the saddles with their skirts. The Victorian skirts were not made like modern aprons which pull undone easily with velcro. In England today, Historical Costume Classes are only allowed to be judged at the WALK for obvious reasons. My Historical Costume is a true replica of a habit that ladies would have worn in Tropical British Colonies such as India, Singapore, and South Africa in the 1880's. They wore lighter coloured linen due to the heat, rather than dark coloured melton wool of their English lady counterparts. You will see that I am wearing the Pith Helmet with a silk scarf which was for sun protection. You could wrap the scarf around your face to protect yourself from the heat. The earrings I am wearing are 19th Century gold - Antique, as is the brooch on my blouse. The blouse is cotton and has a high collar and lace, and long button up cuffs. Only hook earrings were used then. Studs were not invented until the 1920's. The jacket is in true Victorian 1880's fashion and firm fitting, with ivory doeskin leather gloves (which are divine to wear!). The sidesaddle whip is a genuine antique, and in the saddle case is an antique cut glass flask (with a nip of spirit inside), and an antique metal sandwich case complete with a cut sandwich. Inside are also 4 x 1860-1880 coins, and my great-grandmother's crotchet handkerchief. Under the flap and girth points are a pr of gorgeous crochet gloves which were used in case it rained, and I needed to swap a wet pair of gloves for a dry pair. The reason for the coins are that if it rained, I could ask my groom whom would be riding with me to take my horse home, and I could catch a coach instead. Honestly, the women of this era absolutely thought of everything! Also, at least one groom, and usually two grooms would accompany a lady on a ride to help her on and off her horse. Seriously, some traditions should not have died! Under the jacket and skirt....I am also wearing a corset (not too tight), petticoat, pantaloons, fine wool socks and granny boots!!! It was a NIGHTMARE to get onto Razzy in this habit as it was sooo very slippery! It took two helpers, a step ladder, and about 5 x goes for me to get on. He was getting a bit niggly by the 5th go! I am very very blessed to have such a wonderful boy whom I trust wholeheartedly to ride sidesaddle. It is very humbling to see 10yo's tearing around aside! Anyway, I hope that I have passed on some wonderful Sidesaddle history to those who read this. I had a fantastic time finding all the pieces I needed to wear and hold to portray an authentic 1880's Tropical Sidesaddle Habit. Much appreciate the attention to detail. 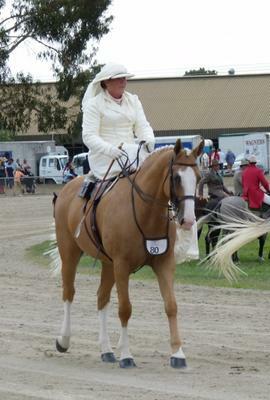 It is very difficult to find information about sidesaddle riding and classes in Australia. Would like more of the same. One thing: would have appreciated more photos. Props to you on the attention to detail! Fantastic article! Gorgeous costume! Thank you so much for sharing. I'm so impressed by the detail of your kit - including the cut lunch sandwich and crystal hip flask! As a re-enactor myself, I'm incredibly impressed by these extra details - props to you for a job splendidly done. Thank you for your article on side saddle. You have peaked my interest in the old style of riding. I'm a horse rider and historian so what a great way to share both interests. Great info, enjoyed learning about side saddle riding.